Black Swan Garden Design: What Fuels Your Garden? When starting up garden projects, or before taking on an hour or two of weeding, it's important to have the proper fuel. During winter and early spring when it's still cold, I can easily motivate for the promise of a glass of wine after the work is done. But during summers and other random spells of warmth, all motivation is on ice. I've recently become a regular consumer of Guayaki Yerba Mate's Enlighten Mint. 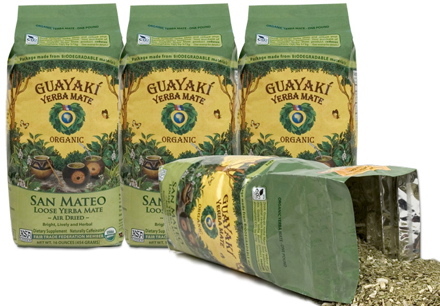 I love the brand but hate single-serving packaging, so as the weather warms up we'll make pitchers of it steeped with bulk-bagged dry leaves, and fresh orange-mint from the garden. Nothing fuels our garden more effectively. Last summer, I had two favorites: a basil-honey lemonade, and a cranberry-honey Mate. If you're a basil lover, you will probably LOVE the iced citrus combination. But a garden isn't built on sugar alone. There must be some caffeine somewhere! This is Portland, afterall. Last year I was fooled by the early appearance of late-spring warmth, and planted out our seedlings too early. This year our cool temperatures are a little precocious, so in order to avoid an encore failure, I broke down and purchased veggie and herb starts from local nurseries. I love the invitation of seed starting, the promise of something created from tiny, unpromising looking varied-color orbs and oblong shapes. We're trying out a couple new Basil varieties this year, "Dani Lemon", and "Super Sweet Chen". It's still early out for them if unprotected, so they're sitting under the sunny eaves next to the house for warmth and dryness. We'll have another month to wait for lemonade from our own basil harvest. Years (and years!) ago, I was hired by the Rob & Michelle Mitchell for one of my very first jobs, waiting tables in a small, friendly restaurant with Sundance quality food. I still crave the roast chickens, spinach fettucine with mustard-alfredo sauce, and the espresso milkshakes. I had my first honest experience with espresso there. In a long-running joke, all glasses were tipped to the mouth with pinky fingers extended. The lemonade was always a summer hit, and drinking it reminds me of the hilarious banter and pseudo-philosophical backroom exchanges between tables. 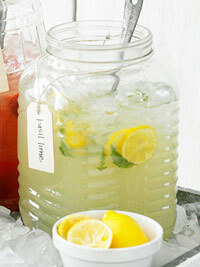 This is our favorite Basil Lemonade recipe, adapted from our friends now in San Diego, the Mitchell Clan. You can see what they're up to these days at http://www.hallmarkgallery.com.